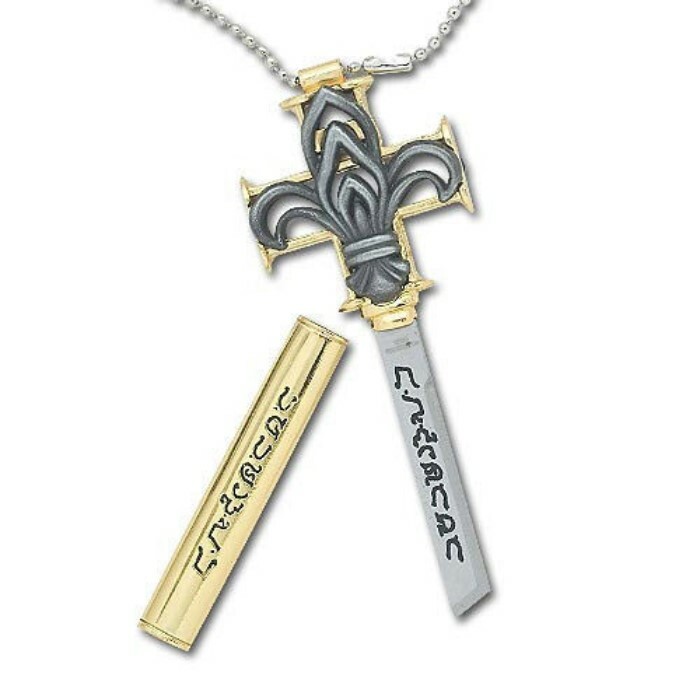 Cross Blade Necklace | BUDK.com - Knives & Swords At The Lowest Prices! Measuring 4" overall this intricate cross necklace reveals a small stainless steel removable blade that is accented with ancient etchings. Includes custom beaded necklace. I like this. I like it a lot. It was a bit bigger than I was expecting, but it still has a solud blade on it, that only took a few minutes to sharpen. In my opinion, the best of the hidden necklace blades you can buy on this site. a novelty item, but alright. the sheath tends to fall off after a while. take a pair of pliars to the mouth of it and it'll fix that. the runes tend to rub off the blade after a while. the necklace is big so there is no tedious clipping and unclipping of it to take it on and off. great blade. expected it to work differently but it works. This is a cool necklace!! but it is a little bit bigger then i thought it was. and i needed to use super glue to keep the blade from falling out. This thing is awesome, couple sharpener runs and its a razor, and for the people saying its bad because its bigger than they expected, read the description, 4 inches, get a ruler if you don't know how big that is! First buy from Trueswords and i have to admit its not going to be my last! The only issues ive had with it is that the after a few times of putting the cover on and off,it eventually just doesnt want to stay on anymore, other than that its pretty cool and fun to show off! 5 out of 5 recommended buy!